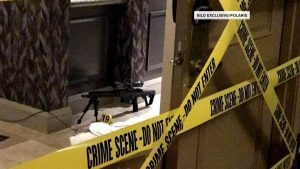 How bizarre and unprofessional can the investigation into the Las Vegas attack get? How has years of Muslim Brotherhood propaganda and its ability to shut down training on Islam inside the U.S. government impacted investigative efforts by the FBI and local/state law enforcement? News coverage on the event – the “deadliest mass shooting in U.S. history” – seems to have all but disappeared. UTT has enumerated the facts we know about the attack as of now, which is not the investigative premise from which investigative action are being taken. See our article here. Most notably, the Islamic State claimed the attack and the attacker as theirs on no less than five occasions since the attack. Yet investigators are not treating that possibility as the most likely investigative avenue to pursue. Knowing and understanding the Islamic threat and their doctrine sharia – the thing that drives everything they do – is critical in cases like this. But at the ground level, basic investigative steps will necessarily be missed and are being missed because investigators, no matter how proficient or how much experience they have, will never get to the truth because they are programed to specifically not get to it. So for all of you out there who are not investigators, yet see this event clearly because you do understand the Islamic threat, the Muslim Brotherhood Movement, and sharia, we (UTT) hope this helps you understand why you can see this for what it is but investigators cannot. The Las Vegas attack, more than any other, puts the success of the Islamic Movement on full display while highlighting the intentional outcome of all of their efforts – complete investigative collapse in the face of overwhelming reality. One more investigative lead that is likely not being followed as it should be…Steven Paddock’s girlfriend, Marilou Danley, is being defended by attorney Matthew Lombard, who also defended Oklahoma City bomber Terry Nichols. Do you have a source for your claim that the girlfriend is being defended by Lombard? This story, which I would have loved reading 10 years ago, now makes me profoundly sad, for what we fail to teach our children about inductive reasoning and world history. But also sad that evil has slipped so easily into our land, as this blog strives to present at the other end of this perspective. I agree. It’s heartbreaking to watch our children being indoctrinated from early childhood to believe that Islam is the “religion of peace”. The Red/Green axis has been hard at work silencing & shaming Christians, while at the same time promoting Marxist perversion & Islamic Supremacy. The younger generations are being brainwashed to believe that hedonistic behavior is moral, normal & required in order to prove that they are “social justice warriors”. They are brainwashed to believe that Christian values are immoral, being right to life is cruel, genders are optional & holding anyone who isn’t white accountable for their actions is racist. At the same time they’re championing muslims as being peaceful, hard working, Americans that are victimized by the evil, white people. They’re marketing the hijab as a fashion accessory & a sign of independence & strength for women & girls. Only in Islam is it acceptable for the men to be men & the women be women. Everyone else must morph into one gender & submit to politically correct groupthink in order to prove they’re not sexist, homophobic, racist, privileged Islamaphobes. These poor kids are so confused & racked with so much guilt about everything from liking their gender to being born white in America that Islam must seem like a safe haven. They can wrap a pretty scarf on their head & magically THEY BELONG! They’re celebrated for embracing diversity, other cultures & not being racist (even though Islam isn’t a race). Suddenly, they have freedom to be a girl & they don’t have to participate in the hedonistic behaviors of the non-muslim society, BUT it’s ok now because they’re still part of the in crowd. Same thing for a boy. In Islam his masculinity is celebrated, he’s not pressured to be bi-sexual & he suddenly has the comraderie of “brotherhood”. They can feel safe knowing that the adults will fiercely protect them & they will be provided structure & instructions for leading a spiritual life with meaning. Marriage & modesty are the other two things that will accepted if they accept Islam. In addition, since opposing views are not allowed, they’ll find themselves in a cohesive group with a distinct culture, clear goals & little diversity. Of course, the safety is a lie & the ideology will eventually rot their souls, but they have no way to know that now. The red axis: chaotic hedonism where anything goes as long as it is perverse, illegal, immoral, divisive, non-Christian, & non-conservative. Elite status can be obtained by becoming a social justice warrior who identifies micro-aggressions that trigger minorities & then fighting for the cause as an instigator or community organizer. The green axis: Islam, structure & guidance for spiritual life. And it all starts by putting on that pretty scarf. What sad times we are living in. I truly believe George Bush & Barack Obama should be charged with treason for lying to the CITIZENS of our nation about the nature & threat of Islam. Dereliction of duty doesn’t even begin to describe the stealth implementation of Muslim Brotherhood operatives into top government positions & national security agencies. The evidence of the suppression of facts about sharia law and Islam is very evident with almost every terror attack, that had the goal to terrorize, to get the politicians and citizens to submit to the doctrine without the knowledge about the intolerance and deception. The goal to conquer our minds and force sharia on the public is insidious and effective…done by muslim professionals such as the Ikhwan or muslim brotherhood organizations that create positive but deceptive images of Islam, they act as a buffer of information as a support system. They can market the hijab, build mosques, deny intolerant doctrine, and act as peaceful inhabitants, until or unless they get exposed. The believers are commanded to deceive the non believer about their goals , may react violently or may travel to fight as jihadi’s but must strive for our submission to Islam. The facts of the warfare doctrine and aggressive nature are denied with many required deceptive activities and outreach programs and words that have meanings that depend on the audience , such as the claim to fight terror, when it is any non believer that does not submit to Islam that they consider, no matter how peaceful, the enemy a terrorist. John is an expert on the subject of the influence and activities of the muslim brotherhood, and it clearly influences the politicians and military to control and deny the information about the terror ties. Such may be the situation in Vegas….a predicted event claimed by isis, that found a convert who may have become willing to be a soldier of allah, with a an unsuspecting identity….but bad enough to strike fear and terrorize. The push back to protect Islam, forbidding the reference is the purpose, the labels are ready to use if any indication becomes apparent the silencing will work to confuse. The politicians or police may not be able to speak, but if a Quran appears and connections are made it will surprise no one familiar with these kind of operations in plain site.